This Nantucket Basket Kidney Purse was originally crafted by me as a special order. I used the rare and exotic Purple Heart wood for the top and bottom plates. Purple Heart (from Brazil) is a dull brown when first worked but turns deep purple on exposure to light. A very dense and heavy wood with straight to interlocking grain, which works to a fine finish. Hand-tapered and beveled cane staves were meticulously hand spaced with only a whisper of space between the staves. 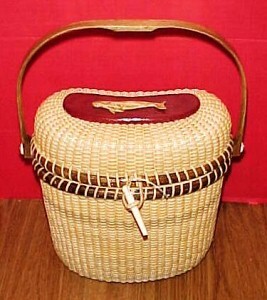 Nantucket-grade rattan cane was used to weave the body and lid of this Nantucket Basket Purse. A hand-carved oak wood swing basket handle was attached to this Nantucket Basket Kidney Purse with ivory scrimshaw knobs and washers and an ivory closure peg. This Nantucket Basket Purse's curved kidney shape design also lends itself to the use of a leather purse shoulder strap in place of a hardwood swing handle. Attached to the basket lid is a finely carved ivory carved sperm whale. The basket rims were crafted of walnut. Cane wrapped leather hinges and closure loops were inserted between the rims with hand-cut notches and secured with thin brass escutcheon pins. An ivory closure peg was used. This Nantucket Basket Kidney Purse is quite large and deep, measuring just over 8" from side to side, 4" front to back in a curved kidney shape, and 8.50" high at the basket lid, and 6" to the rims of the basket body. As are all my fine Nantucket baskets, I signed and dated the base of this Kidney Nantucket Basket Purse. This kidney shaped Nantucket Basket Purse caused quite a stir and controversy on Nantucket Island a few years ago. A local Nantucket Basket merchant held a patent on this shape so that no other basketmaker could reproduce it. Only after a lengthy legal battle was her patent revoked allowing weavers to interpret this very popular style of handbag in their own creative way. I am in the process of cutting and shaping other exotic woods to use with this unique and contemporary Nantucket Basket Purse. A stitched or braided leather shoulder strap can replace the finely carved oak swing handle for a more contemporary look. Although I am no longer accepting orders for the Nantucket Basket Kidney Purse, I do craft one or two of these per year. When its ready for sale, you can purchase it directly from my Simply Baskets website.